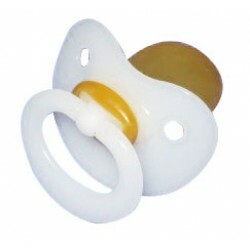 Various Baby Pacifiers modified with a large Latex MedicPro (NUK5) Teat for Adults or comparable teat made of Silicone. The MedicPro teat is unlike conventional pacifiers, a therapeutic suction trainer and medical device with a fun print for adults. Delivered as a therapeutic tool it is an important contribution to overcoming poor sucking and normalization of disorders in the oral motor skills (eg, mouth breathing, disorders of sucking, chewing, swallowing, speech and facial expressions). Please clean your pacifier with warm water & soap before use. THE LARGE PRODUCT IMAGE ABOVE WILL CHANGE TO A LARGE VERSION OF SELECTED IMAGE. Vacuum baby bottle with or without symmetrically Big NUK MedicPro Cleft Palate Teat for adults. ..